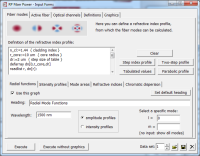 The software contains an efficient mode solver, which can calculate the amplitude profiles, effective mode areas, cut-off wavelengths, propagation constants, group velocities and chromatic dispersion of all guided fiber modes from a given radially symmetric refractive index profile. This is very useful both for models with passive and active fibers – even for cases with several hundred modes. 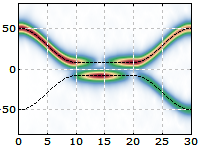 Example cases show how one can analyze the modes of a graded-index fiber, or simulate launching light into a multimode fiber. See also our demo video for using the mode solver. Since V5, RP Fiber Power can propagate optical fields with arbitrary complex amplitude distributions through fibers or other waveguides with arbitrary weakly guiding refractive index profiles. The fiber may be bent (with arbitrarily varying bend radius), tapered, exhibit random index variations, etc. – there is a huge range of opportunities for a wide range of research topics. Example cases show studies concerning the evolution of light for a misaligned input beam, pump absorption in double-clad fibers, and the behavior of light in a tapered region of a fiber. A convenient interactive beam profile viewer allows you easy inspection of any calculated beam profiles. Normally, one works with the standard gain model which is relatively simple. 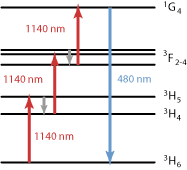 For more complicated laser ions, however, it is possible for the user to freely define energy level schemes of laser-active ions and a great variety of processes inducing transitions between these levels. Therefore, the software is applicable to any conceivable laser ions (Nd3+, Yb3+, Er3+, Tm3+, Pr3+, …) and pumping schemes. It can even handle cases with different ion species combined (e.g. Yb3+ and Er3+) or with complicated quenching processes. It can also describe upcon­version lasers of various kinds. You can define a large number of so-called optical channels for pump waves, signals and amplified spontaneous emission (ASE). Each channel may represent either a single propagation mode or some (possibly large) collection of modes. You can freely define its transverse intensity distribution, or simply use the mode intensity distributions from calculated fiber modes. The software is also suitable for modeling devices based on double-clad fibers. For lasers, both linear and ring configurations are possible. The software can also simulate the temporal evolution of optical powers and excitation densities. 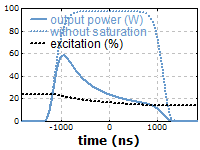 For example, it can simulate the distortion of an optical pulse by gain saturation during amplification in a fiber amplifier (see the figure). It can also simulate the pulse generation in a Q-switched fiber laser or even a bulk laser. Dynamic simulations are possible both with propagation only of optical powers and with propagation of full beam profiles. All this can be done with uttermost flexibility. For example, you can freely define the time dependencies of the powers of pump and input signal waves, and illustrate the results as you like: display how the values evolve within a pulse, show how the pulse parameters evolve for multiple pulses, etc. The software can simulate the propagation of ultrashort pulses in passive and active fiber devices, and also in other components such as spectral filters, manually or automatically optimized dispersive compressors, prism pairs and grating pairs, modulators and saturable absorbers. One may thus model not only single-pass amplification in a fiber amplifier or data transmission in a telecom fiber cable, but also the pulse evolution in mode-locked fiber lasers, chirped-pulse amplifier systems, regenerative amplifiers and fiber interferometers. The interactive pulse display window allows one to conveniently inspect all details of the pulses. The temporal and spectral pulse properties can evolve in a fiber under the influence of arbitrary chromatic dispersion (which may be obtained from the mode solver), the Kerr nonlinearity, stimulated Raman scattering (SRS) and amplifier gain (including gain saturation). Self-steepening can be included; even supercontinuum generation can be simulated. A refined numerical algorithm with automatic step size control ensures a high accuracy combined with high speed. RP Fiber Power comes with a substantial number of fiber data sets, containing spectroscopic data for various laser-active glasses doped with ytterbium, erbium, thulium, etc., and partially also waveguide parameters. Some data sets contain data from the scientific literature, others are obtained from fiber manufacturers cooperating with RP Photonics. In addition, you can easily integrate any own fiber data in the software. You can also use the technical support in order to get additional fiber data files, made from data which are supplied by the user or the manufacturer. You may use RP Fiber Power even for bulk lasers, as long as the beam radii are approximately constant within the laser crystal. This condition is well fulfilled for many end-pumped lasers. For example, you may simulate a Q-switched Nd:YAG laser, investigating pulse build-up with continuous or pulsed pumping, multiple transverse modes, the influence of quenching processes, etc. Also, you can investigate more complex devices such as regenerative amplifiers. The quality of the user interface is an essential aspect. RP Photonics has found a most convenient way to combine two features which would normally exclude each other: an easy start by just filling out interactive forms, and uttermost flexibility with a powerful script language. Based on your form inputs, a script is automatically generated and executed. This method is sufficient in most cases. For special additions, you may inject some additional script code via the forms, or edit the whole script. Exploiting the script language, you may implement even the most sophisticated simulations, going beyond anything anticipated by the developer. For example, you can arrange for arbitrary sequences of fibers and other optical elements in ultrashort pulse simulations. Also, you can use script code to mathematically process input data or calculated results, to read from or write to text and binary files, to generate all sorts of diagrams, and to display outputs in nicely formatted form as text (in the program's main window or written into diagrams or files). Since V6, it is even possible to create custom forms: get forms for specialized simulation purposes, either made yourself or within the technical support. V7 introduced additional features to support you in the development of scripts – in particular, syntax highlighting in the editors, parameter help, automatic code reformatting and the debugger. Most importantly, our high quality technical support (see below) allows you to get problems solved very quickly. See also our demo video for scripting. For serious modeling work, you need a high quality product with comprehensive documentation. RP Fiber Power comes with a very detailed PDF manual, explaining not only the handling of the software and the details of the script language, but also what kind of physical model is used, what are the underlying assumptions, etc. In addition, you get all this information in the form of a convenient context-sensitive online help system. Also, there are over 40 case studies which illustrate many aspects of the possible simulations. The license fee always contains some number of hours for technical support. The support is done personally by Dr. Rüdiger Paschotta, the developer of the software and founder of RP Photonics. He will give you high-quality technical consultancy on fiber devices even on scientific and technical issues going far beyond purely software-related questions. Be assured that with RP Fiber Power you are obtaining a product which has been developed by a top expert in the field, who surely understands the involved physics and knows the scientific literature. And this expert will personally help you to solve any problems you may have. The software runs under Windows 10 or older versions down to Windows XP. Due to the efficient implementation, the requirements on the PC are generally moderate; only in special cases, it is advantageous to have a fast CPU and a large main memory. Maybe you want to download the RP Fiber Power PDF brochure with 39 pages. Go for the Best Available Tool! No matter whether you are developing fiber laser products in industry or doing scientific research – for being successful and competitive, it is essential that you have the best available tool and support to get your work done in the most productive and efficient manner. Don't waste your time and other valuable resources by trying around with insufficient means.